Choose a unique experience that you’ve always wanted to try and plan your holiday around it. Vietnam has been named among best destinations that you aren’t wasting too much time on travel, according to a list released by The Economic Times, an English-language, Indian daily newspaper. 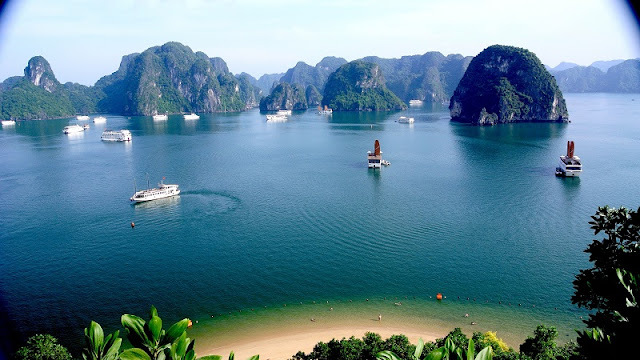 Ha Long Bay limestone islands are an iconic tourist spot of the country. Apart from the picturesque Ha Long Bay, the visit to the longest dry cave in the World-Paradise Cave should be included in the list of must-go must-see spots of Vietnam. “Thereafter, head over to mountains of Cao Bang for pristine air and untouched landscape. Con Dao islands’ reef and coves, Mekong Delta’s backwaters and the national parks are some other iconic points,” The Economic Times wrote. According to The Economic Times, Vietnamese culture features an intoxicating blend of different influences; the Indian/Hindu influence in the South is seen across the architecture in temples and cuisines; Chinese in the North; Vietnamese in the center reflected across the port of Hoi An, royal tombs, pagodas. Apart from these cultural influences, marvel at the modern day wonders of Vietnam are worth seeing as well. Visit the recently unveiled Golden Bridge, a 150-meter long pedestrian bridge, near Da Nang, Vietnam, The Economic Times suggested. Earlier, Vietnam has been named one of the best places that everyone shoud be going in 2019, according to Chief Executive of Intrepid Group James Thornton from Traveller, an Australia travel website. Chief Executive of Intrepid Group James Thornton has just named Vietnam the number one country for cycling tours and second for visitor food adventures. It’s also the place where a US$20 round of drinks will go furthest 14 beers compared to two in Japan or three in Turkey.